Whitehot Magazine, 2012. Original article. Or maybe it was too much to ask, because by the time the 1980s rolled around, boasting a very different brand of radicalism, people had stopped picturing this fantastical future. So where did the dreams go? At least this is what I am wondering after spending a couple of hours surrounded by the imagination of Buckminster, lovingly displayed at the San Francisco Museum of Modern Art. While Fuller (1895 – 1983) never lived in the Bay Area, he lectured here extensively, making this exhibition a perfect fit for an area with a unique magnetism for idealists, inventors, non-conformists and dreamers of various ilk. In 1965, Fuller initiated something he called the ‘World Game’ project. He described it as a data-visualisation system to facilitate global approaches in solving the world’s problems, wanting it to contribute to “mak[ing] the world work, for 100% of humanity, in the shortest possible time, through spontaneous cooperation, without ecological offense or the disadvantage of anyone”. Nowadays we call it the internet. Fuller believed greater access to information would generate more humanitarian problem-solving, and on a good day, that is what the internet does. There is a lot of work to do still, but l think Buckminster Fuller would be excited about what comes next. Posted on 01/28/2015 by Jess. 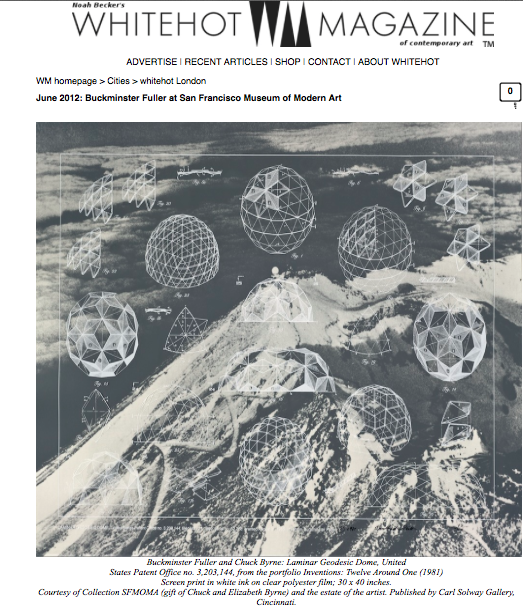 This entry was posted in Art writing and tagged art, buckminster fuller, san francisco museum of modern art, whitehot magazine. Bookmark the permalink.